Besides Hubby's 39th birthday, two other important occasions also occurred on Sunday. First, it commemorated the 5th anniversary of the death of Hubby's grandfather Job (pronounced "Jobe" or "Joe-b". As in "the patience of..."), who died on Hubby's 34th birthday back in 2004. I was pregnant with Middle. Hence, Middle is named after him. Second, Eldest made yet another leap into big boy-dom. He gave up (sleeping with) his security blanket. This summer, he had stated, on his own, that he was going to give up his "blankie" when he turned 7 in October. Well, that didn't happen. He wasn't ready. Instead, he decided that he'd do it on Daddy's birthday. Hubby and I had, of course, completely forgotten about it. But early Sunday morning, Eldest came up to me and said, "Mom, remember that you need to get me a box? I'm putting my blanket away today!" My biggest boy. My Eldest. Needless to say, I constantly threaten and tease him that I'm going to put a brick on his head so he'll stop growing up. "You can't put a brick on my head Mom - I'll just knock it off!" And that regardless of how big he gets, Rule #1 is that he must ALWAYS HOLD HIS MOTHER'S HAND. "I will, Mommy." Hellz no! We're certainly not giving up the blankies (or thumbs) anytime soon. I love that you're keeping those memories! And you're knuckleheads are precious. JOB! Just show that kid some Arrested Development and he'll be honored to carry the name. Or, er, at least he'll find it slightly more amusing. I know I do. 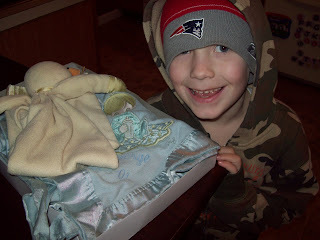 My 3 year old has decided he does not need his "baby" (blankie) anymore. He refuses to sleep with it but he does hold it while we are reading. He says he is going to give it to the new baby when he arrives. Too EARLY for this. I was shocked and saddened at him growing up. Of course, we will se if he really gives the baby to the baby! Love the picture of your knuckleheads! Very sweet. 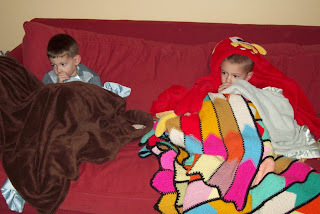 My 4 yo son LOVES his blankie so I am expecting it to be wrapped around his shoulders on his wedding day. Kids, eh? Enjoy them while they're young, for they grow up soooo fast! My youngest went for her first scan today and came home so excited, clutching the image of her fetus. Where did the last 26 years go? Blankies and lovies can still be found on my 12 & 14 year olds beds! Only now they are tucked between mattress and wall where visiting friends won't see 'em! Came over from Bossy -- enjoy the love! Dammit, now I'm all weepy. Aww How sweet was that. I, like you, fear the day that some snotty little girl *hmphh* comes to steal my boys away. Oh no! This is scary for me because my oldest is about to turn 7 and he has a stuffed eeyore and a blankie that he's had since he was a baby. I'm with you, he can sleep with them until he's a teenager, I'm fine with that. I'm going to be a mess when he decides he doesn't need them anymore. How has he been doing without it?